Over the last 12 years, Greek House Chefs has accommodated all types of allergies such as gluten, lactose, shellfish, dairy and peanut allergies etc. "It's just something that we do" states Owner Carey Hansen. "All of our students are on the meal plan, so we make sure that ALL of them eat, regardless of dietary restrictions". The Greek House Chefs team has developed a training protocol to teach fellow distinguished Blue Coat Chefs the importance of accommodating allergies. 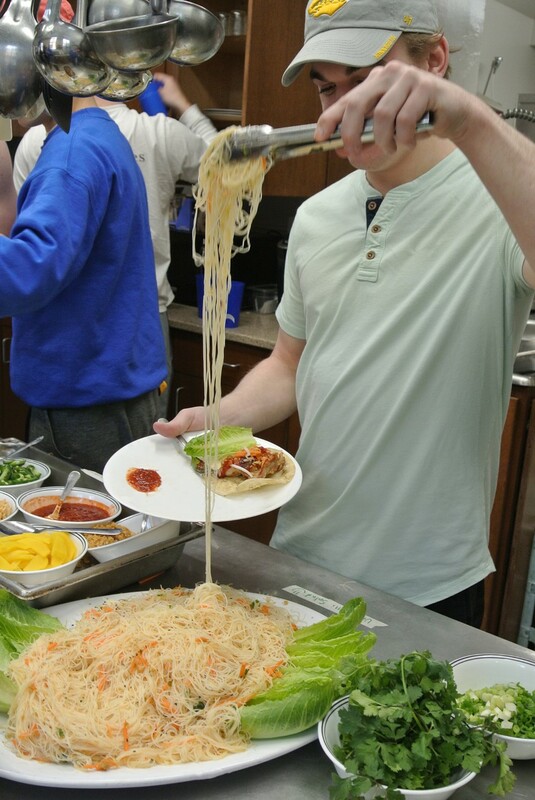 When new fraternity member Colin's allergies were listed by his doctor and sent to Greek House Chefs in the fall of 2018 to make sure they could be accommodated before he moved into Delta Upsilon at Iowa State University, we knew we were ready for the challenge. "We knew that this was going to need a different approach than what we were used to," shares Hansen. "This is one of the most severe food allergy cases we have been challenged with, but I knew that there was no better person for this than Chef Darrin." Colin's food allergies are life threatening and include milk, eggs, wheat, barley, rye, spelt, green beans, green peas, legumes and peanut. Colin's Doctor shares that "Colin has food-induced anaphylaxis which is a severe and potentially life-threatening allergic reaction." "He is extremely sensitive to his food allergens as evidenced by acute breathing problems associated with airborne exposure. This condition has a profound impact, as Colin must personally investigate and verify the ingredients of any food he consumes. This may not be possible if there is no food label, or if the Chef who has prepared the food is not available." This is where Campus Manager Chef Kevin and Fraternity Chef Darrin come in. Rather than run from this and tell Colin he couldn't eat or live in the chapter, we developed a plan and let Chef Darrin utilize his years of knowledge as a CEC (Certified Executive Chef) to make sure Colin is completely taken care of. "The outcome has been incredible! So incredible, I had to see it for myself," states Hansen. So, last week, Carey drove up to Ames, Iowa to visit with Colin about how his allergies have been accommodated by Greek House Chefs. Carey sat down with Colin in the dining room at Delta Upsilon and talked about what it's like to have severe allergies and live in a communal setting like a fraternity house. Colin shared that he wasn't sure about living in a fraternity at first, as he wasn't confident that a Chef would be able to make a meal plan happen for him. Colin has been hesitant to eat out in restaurants as the allergies are so severe, until recently. Chef Darrin and Colin started working together to develop a plan before he moved in. Cross-contamination was a real fear for both of them, so they decided to create a protocol for Colin's food preparation and storage. They decided that Colin's pots, pans, serving utensils and dishes would be stored safely away from the regular service items in a sealed container. From there, they worked with the chapter to source a separate refrigerator for food storage. 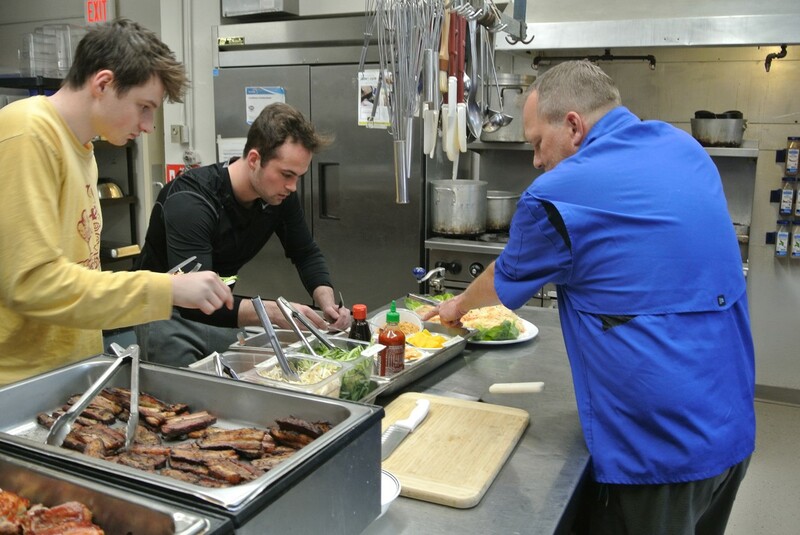 After those issues were addressed, they discussed what fraternity food service would look like for Colin with Greek House Chefs in the kitchen. Chef Darrin took the time to understand all of Colin's likes and dislikes and has asked a lot of questions along the way. Colin was open and willing to try new foods and Chef Darrin was eager to enhance his pallet in a safe, yet delicious manner. Together, over the course of the school year, the two of them have created an irreplaceable bond over food and food safety. Rather than seclude Colin and just make him the same dishes over and over because they were considered safe, Chef Darrin dove in and started researching how to create similar alternatives to the foods he was already serving his chapter. From coconut milk "cheese" to dairy free "creams", Colin is eating foods very similar to what his fraternity brothers are eating with just a few small tweaks to meet his needs. If creamy Alfredo pasta is on the menu, Colin can eat almost the identical meal once Chef Darrin works his magic. Serving Colin gluten and wheat free pasta with an alternate sauce, Colin is able to enjoy the same meal right beside his brothers. Chef Darrin shares that "Everyone in the house is very aware of Colin's food allergies, and they think it's great that I have been able to provide the same level of quality of meals that I am serving them". Chef Darrin goes on to say, "For me, I took it as a challenge. As a culinary professional, this has taken me to new places and forced me to develop my craft and learn new styles of cooking. Who would have thought I'd be making "not-so-cheesey caprese"! I essentially start my day cooking backwards. For example, if I am making fried rice for lunch, I will start with Colin's meal preparation and then add in the peas, carrots and fried eggs after I have finished Colin's portion and properly stored it." Chef Darrin continues by sharing Colin's food safety plan, "Colin and I came up with a proactive plan just in case there is an incident of contamination by someone in the chapter. It's a fraternity, guys are going to make food over night and on the weekend in their space. We have placed an epi-pen in the kitchen should the need ever arise. Colin has taught me how to administer it to him, heaven forbid we would ever need it". Owner Carey Hansen was speechless. 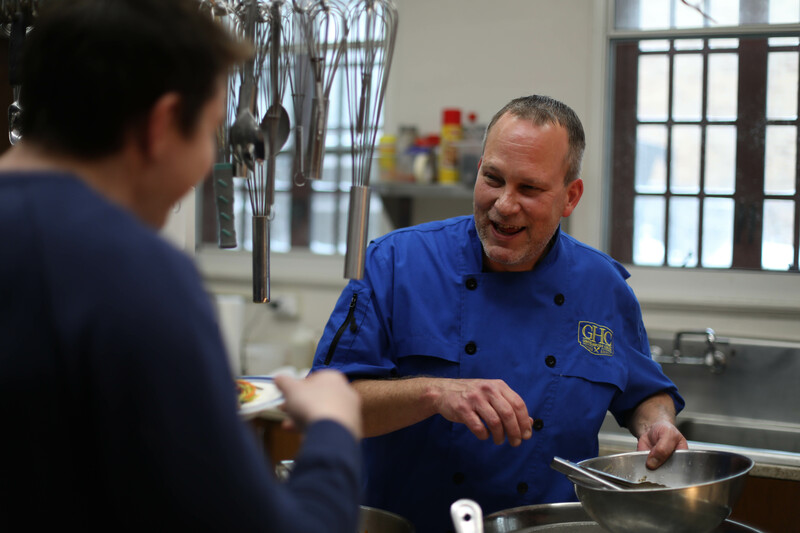 Colin has truly inspired Blue Coat Chef Darrin to become a unique, out-of-the-box thinker and a better Chef. 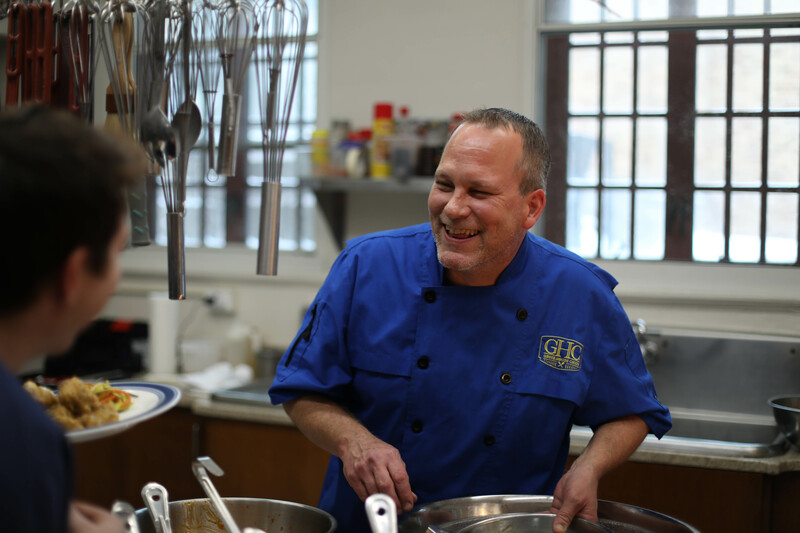 "Having challenges at Greek House Chefs is inevitable," states Owner Carey Hansen. "Having the talent and eagerness to learn from Chefs like Darrin and to understand and pivot when necessary was something that I never thought could be achieved on this scale. Some chefs would be scared off by such a challenging case of food allergies, but Chef Darrin has made accommodating severe food allergies a regular day-to-day occurrence. As always, GHC is learning and growing to meet the needs of our clients and we are now in the works of implementing this protocol nationwide for any of our severe allergy situations. Hansen shares, "GHC is only as good as the Chefs that we hire. I trust them and they make Greek House Chefs shine each and every day". In "Insider" , "Fresh Produce" , "GHC" , "Food" , "Recipes"
In "Chapter" , "Blue Coat Chefs" , "Fraternity Food Service" , "Greek House Chefs" , "Greek Life" , "Our Brand" , "Sorority Food Service" , "GHC"
Previous Post Who is... Corey Hansen? Next Post Who is... Jordan Higgins?